Registration for this class has passed. Please email Susan@FrostedCakeStudio.com if you are interested in this class or would like to plan a private cupcake decorating event similar to this! 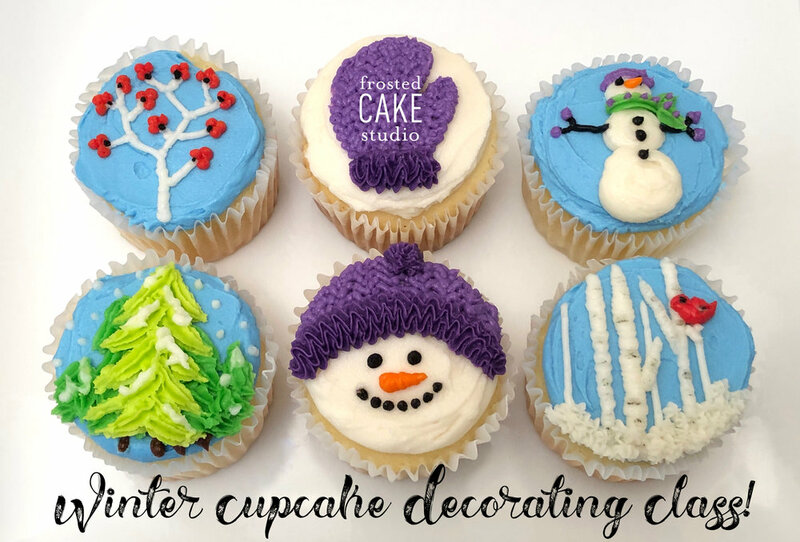 Join us in this fun class and learn how to craft buttercream to look like your favorite winter scenes. Decorate cupcakes similar to photo or use your imagination and create your own designs. Creativity is encouraged! Gain skills that you'll be able to use to decorate your own cupcakes and cakes in the future. take home 6 beautifully decorated cupcakes in a box to enjoy and share! feel free to bring your favorite wine or beverage, we'll provide glasses! Space is limited to 12 and advanced registration is required. Everything you need, including tools and materials, and aprons, will be available for your use during the workshop! Class is scheduled for 1 1/2 hours and may run a bit longer! Class are recommended for adults and children 14 years and up, unless noted. Children between 8 and 14 years old are welcome to register along with a paid adult. Must be 21 or older to consume alcoholic beverages. Classes must be paid in full when reserved. Class size is limited to 12. Classes may be subject to cancellation, postponement or rescheduling due to insufficient enrollment or inclement weather. Class fees are not refundable unless class is cancelled by Frosted Cake Studio, but may be transferrable if arranged in advance of class to another class or can be exchanged for credit toward custom cake purchase. Class is being held in the Workshop Room at Launch or Land, 106 E. Butler Ave., Ambler, PA 19002 (located between the Ambler Movie Theater and Rita’s). Please note: Facility is not allergen free.